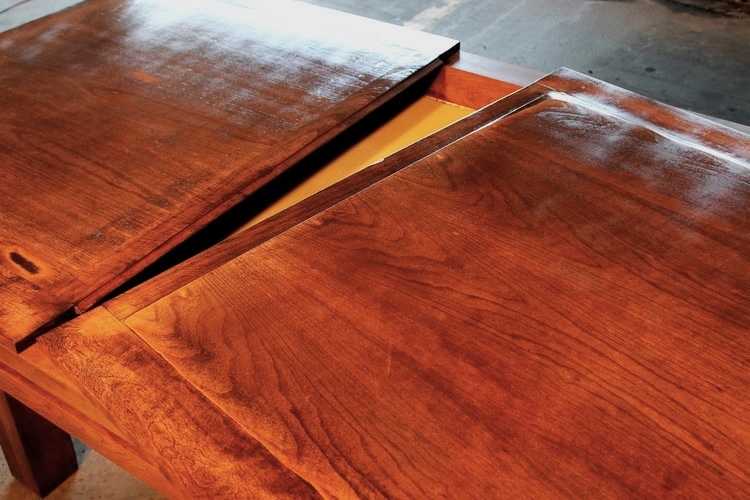 Beautifully hand-crafted, each gaming table is custom-made to your specifications. 3 ½ inches of awesome and designed to keep your game pieces and bits from rolling onto the floor, or being lost forever. Allows for marathon gaming sessions, without needing to remember and reset the board every time. A two-piece topper that nests on top giving you a solid, spill-resistant surface. Or inset multi-planks that sit flush in the rails. Each option is lovingly handmade and custom fit to meet your needs. Your choice of wood stain to match your table, or mix it up with a dual tone table and topper. 6mm (1/4 inch) thick closed cell neoprene with a nylon surface. Allows you to easily pick up cards without dog earing the corners while still leaving a nice thunk as you roll your dice. Nylon produces an excellent glide surface allowing cards to easily glide from one end to the other. Allows the mat to be completely removed from the table either for cleaning or for those times that you just want to hear that dice on wood. Click here to view different color options for the nylon facing. (Please note that there may be minor shifts in color due to display differences). For accurate pricing, request a quote below and build your own custom table now!